Oh Julia!!! You are as entertaining as your daddy! :) Love this! She is adorable! I love "Fee-oh"! She is SO cute. I hope "Julia Says" becomes a regular Patton feature. And I love that she called Theo a stinkpot. Love it! There are few things that entertain me more than the thought processes of a toddler. lol! we need to have some videos of Julia talking, or better yet, a vlog!! she is too cute! Dying. I'm honestly trying to figure out which one is my favorite. I don't know. They're all comedy gold. This is hilarious. And I love "the stinkpot." Always entertaining, Julia, my girl. Leave your mom alone a bit, ok? I love the "so frustrated" one. It always stops me for a second when I hear my kids use phrases I know they caught from me. My son said, "You gonna have meltdown now? I better go downstairs." after he dumped a load of newly folded laundry on the floor during an already stressful bedroom clean. ha! stinkpot is my fav. promise i had almost entirely typed out today's copycat of a post before i read yours- great minds. we should have made it a link-up! Hahaha. Those are too good. hahaha so cute, love it! When my friend's son, Joseph, was a newborn, his older sister (who, then, was around Julia's age) called him "Joe-fuss." I just love children's talk! love the new "what does J say" installment!!!!!!!!!! This was AWESOME!! Oh my goodness. I laughed so hard. "You so fwustwated"!! And the jeans/exercises??!!! Hahahahahahaha!!! Grace! You are a riot. thanks for keeping it real. But wait. . .you keep a tangible journal, too?!!! This just blew my mind. LOVE! LOVE! LOVE! I want to be "fixty-nine"! I have a tough wake-up every stinking day of my life! LOL! Love you little girl! Can we please have a frequent rotation of "Julia says"? because this is to die for. wine one is a def fave. she is too cute! She's cute! Congrats for braving Costco alone! You deserve an award, or chocolate. The Musings of Julia-Child. A riveting new segment of the Camp? Hope so. hahahah! i love "stinkpot"..we may or may not use that term of endearment in our house too! my favorite is the "fwustated" though. best. Love her! Two year olds are the cutest! Haha that is soooo cute! I love that she calls Theo stinkpot! I loved this! She is soooo funny! I hope it becomes a regular too! ha!! I doubt there's a funnier 2 year old out there. She obviously inherited her parent's wit!! She is hilarious and so cute! Mine asks me some version of the "U frustrated?" question a lot - guess I must be! LOL ;) Time to reassess when he asks that one! This is priceless! Thanks for sharing - she is so stinkin cute! I really need my future child to be like her. Like really. So cute! Love the top photo - I can't tell you how often we see the same move from our little Genevieve, except she is four... much less cute. 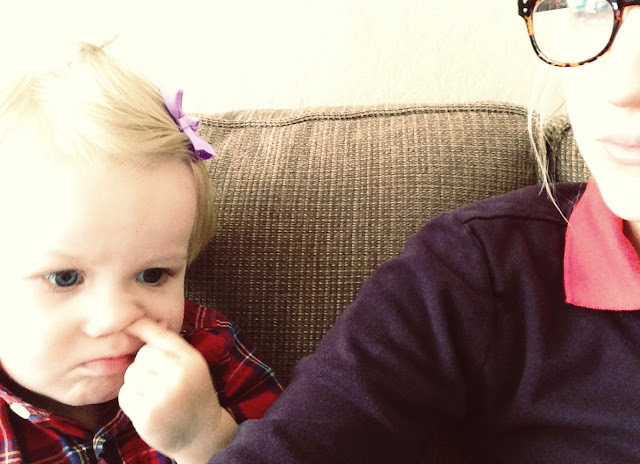 I keep coming back, specifically to look at the nose picking picture. I can't handle it! This just made my day. Hillarious. And not to worry, I frequently do jean exercises as well. hahaha stinkpot. i'm stealing that one. thanks jules. Julia is so so funny. Please make this one a regular feature -- she is a charmer. And you transcribe the toddler accent so well.